Groove Armada play all night long. Having carved their own signature house sound over the last two decades, Andy Cato and Tom Findlay are one of electronic music’s most instantly recognisable duos. While their back catalogue spans eight studio albums and a string of acclaimed singles, they’re equally renowned for their DJ sets. They’ve also been regular guests with us throughout our history, with a stellar FABRICLIVE 87 album in our mix series. This February they prepare to dig into the deepest corners of their collections for their first Room One all-nighter. Josh Butler brings Origins Rcrds to Room Two. Having released across imprints like Rejected, Hot Creations & 8bit, the Manchester-based artist has honed a style of deep house that sounds like few other producers today. Most recently he’s placed his focus on his own imprint, Origins, where he’s teamed up alongside the likes of Kerri Chandler, Groove Armada & Richy Ahmed. 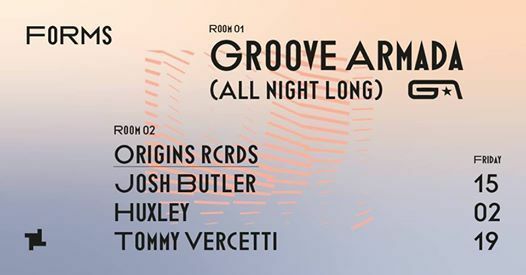 Joining Butler for his Origins showcase is UK staple Huxley, while rising talent Tommy Vercetti rounds off the bill.